WordPress started off as a blogging tool. One of its core strengths is the ability to post information in a blog or news-like fashion. We have configured Faculty Websites to take the blog functionality and use it as a News feature on your website. Expand the Posts section and click the Add New button. Alternately, you can select Post from the New menu at the top. Type or copy and paste in your content in the Body field. 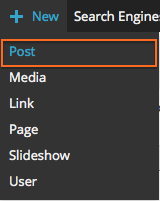 In the Post Tags box, type in any tags you want associated with your News Post. Hint: hover over the Question marks for a description of tags, categories, etc. Click Preview to see what your news post will look like or click Publish to publish your News Post. Any additional News Posts will appear in the News section in reverse chronological order. 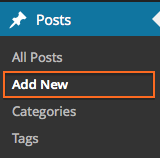 Go to the Posts section by clicking on Posts in the Dashboard. Hover over the Sample News title and click the Trash link that appears. This will move this Post to the Trash. Hint: If you move a Post or Page to the Trash, you can retrieve it later by clicking on the Trash link and selecting Restore. You can also delete Posts or Pages permanently by choosing Delete Permanently.